Participants in the “Longest Night Vigil” arrive at the site of the planned Foster Road Shelter on the evening of the Winter Solstice. 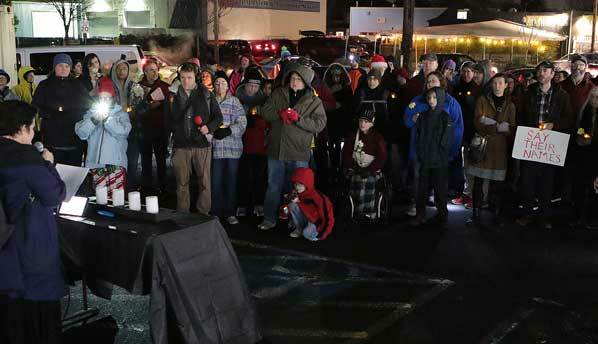 Although it won’t be open until later this year, the county’s Foster Road Shelter, at 6144 SE Foster Road, near Holgate Boulevard, was the site of a vigil held on December 21 – the Winter Solstice; the longest night of the year. One of those who walked over from St. Mark’s Lutheran Church on Powell Boulevard at SE 51st Avenue to the rally point was Multnomah County Chair Deborah Kafoury. “I’m here with people concerned about the homeless – [holding a vigil here,] where, this fall, we’ll have 120 new beds that are sorely needed in our community; it’s going to be great shelter,” Kafoury told East Portland News. Some holding signs, others with candles and lights, the supporters quietly listen to speakers at the vigil. Southeast People of Faith event organizer Bonnie Beadles-Bohling listens to the presentations. 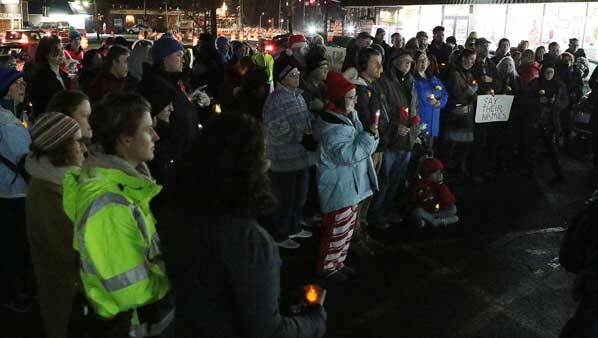 “The vigil developed in response to a meeting held in December in which, in her opening remarks, Multnomah County District 3 Commissioner Jessica Vega Pederson talked about all communities, including those of faith, becoming involved in the homeless crisis,” explained organizer Bonnie Beadles-Bohling. She’s with a group called Southeast People of Faith. “Those gathered here are naming and remembering [homeless] people who died on Portland’s streets in the last year; and, at the same time, they’re showing support of the Foster Road Shelter, and committing to collaborative care of our shared space,” Beadles-Bohling said. (Far left) Sandra Comstock of Right to Survive read words written by a homeless person, Becca Watkins, describing her experience of not having access to a bathroom or clean clothes. 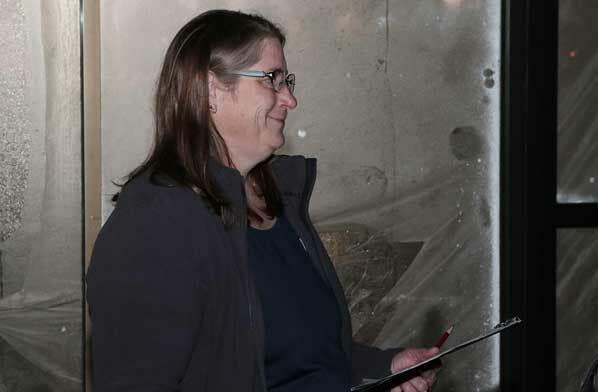 Ringing a bell, as they alternate reading the names of homeless people who have died, are Alys Allwardt from Pilgrim Lutheran Church in Lents, and Paul Underwood, director of Operation Nightwatch. 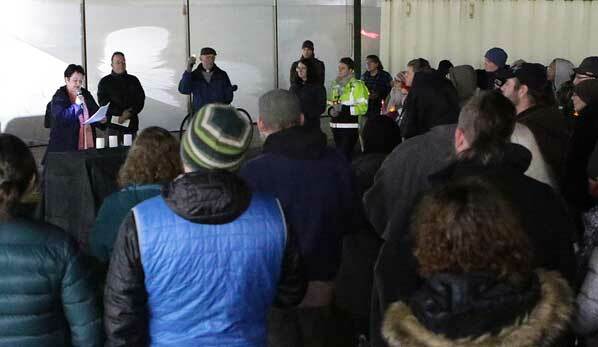 As many as 100 people, representing a dozen area churches and organizations, gathered in the parking lot as two volunteers rang a bell, and read names of homeless people who had died in Portland in the last year. Committing, as a community, to ensure equitable access to bathrooms, garbage services, and safe overnight camping areas. 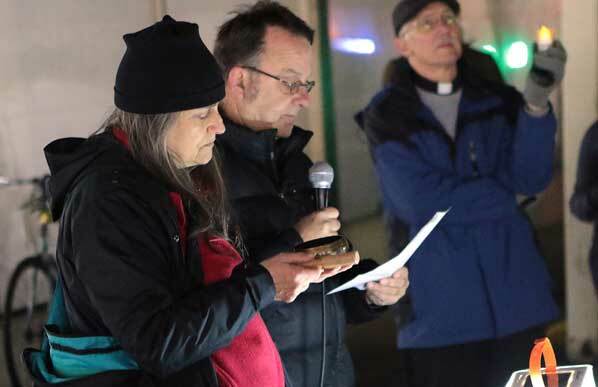 Pulling their collars up against the wind, those attending the “Longest Night Vigil” listened to the speakers, and vowed to help improve the condition of the homeless. “What we hope will be the outcome of this will be to build positive relationships between neighbors, housed and un-housed,” explained Beadles-Bohling.